The community is supported in part by wonderful artists who become Patrons. Along with the joy of knowing you help make this art community possible, when you become a Patron you receive a bunch of fun and helpful extras. Instead of a link with a giant number at the end like app.sketchclub.com/user/203948572384578 you get a beautiful link like sketchclub.com/your-nickname This is great for sharing with friends outside of the app and can be easily remembered. Simply edit your profile infos to change your custom link. If you would like to protect your works online with a watermark you will love this options. When you upload a sketch (or edit an existing sketch info) you will see a Watermark option. If you select this a watermark will be automatically applied to your sketch when it is displayed in the community. You can configure in your profile what name to include in its copyright message. When you change an existing sketch it may take a few seconds to be applied so return to your sketch after a bit to see it. From your profile page you will find a link to your private stats page which graphs how many views your sketches have had over the past hours, days, and months. You also can see which sketches are being over the past day and week. This is really fun to check after sharing your sketch online. You can optionally enable e-mail notifications for important events like receiving a private message or getting a new fan. The source .sketchClub files for sketches are very large so when they are shared online it is intended just for co-ops. Becoming a Patron gives you the ability to upload these files with your sketches and keep them private so only you can download them. This is a great way to keep an extra copy of your important sketches. Have an old sketch you uploaded and want to use it again but don't have the original sketch anymore? No problem. Now you can have the server synthesize a .sketchClub file for you complete with sketch stats so you can edit it or rework it without any image loads! This is available on the sketch page in the new community mode for Patrons. 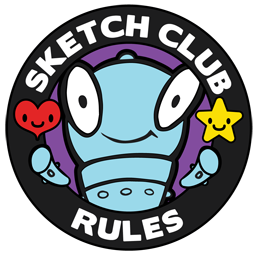 To purchase a membership visit the SketchClub Store on the web (sketchclub.com/store) and login with your linked Google or Facebook account. Thanks so much for your interest and support!